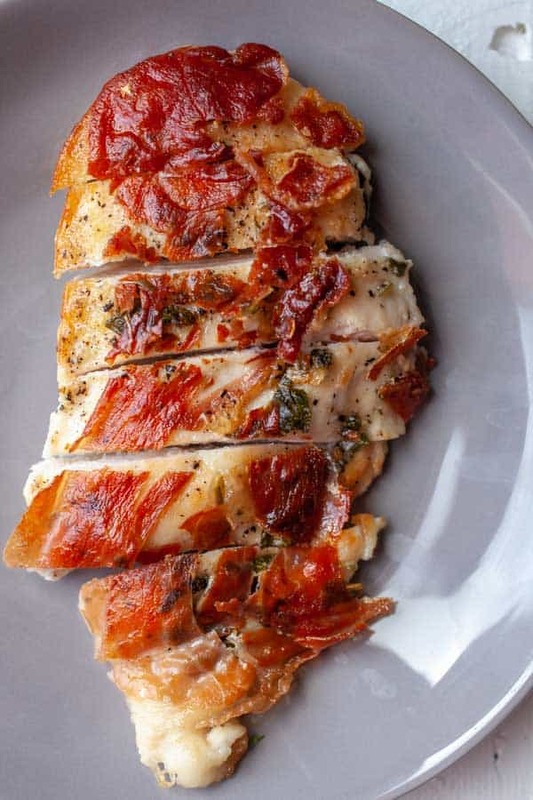 If you need a special occasion dinner, you should bookmark this Chicken Saltimbocca recipe! It’s done in literally 40-45 minutes but looks like much more work than it is. And it’s delicious! If you’ve never tried chicken saltimbocca, you need to fix that problem PRONTO! 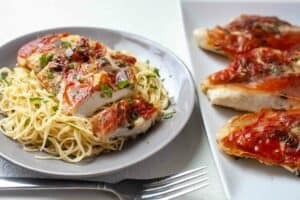 I had honestly never heard of this dish, chicken saltimbocca, before I read about it in the cookbook, but it has some of my favorite ingredients. The idea behind the dish is that you have a nice chicken cutlet that is lightly floured. On top of that cutlet you have a slice of good prosciutto that has been seared onto the cutlet so they become one. The prosciutto forms a crispy layer of awesome on top of the chicken and the whole thing is flavored with some fresh sage. I served my chicken saltimbocca with spaghetti tossed with lemon butter pan sauce. The classic Italian chicken saltimbocca dish made at home! It’s easier than it looks. 1) If you are starting with whole chicken breasts, cut them in half horizontally, then pound them out until they are an even thickness. One breast will make two cutlets. 2) Dry off cutlets well with a paper towel. 3) Dredge cutlets in flour and season with salt and pepper. Sprinkle diced sage on top of each cutlet. 4) Press one large piece of prosciutto onto each cutlet over the sage. Press down on it so the prosciutto sticks to the cutlet. 5) Heat oil in a large skillet over medium-high heat. Once hot, add cutlets, prosciutto side down first. Cook for 4-5 minutes on that side and flip. The prosciutto should be browned and adhered to the chicken. 6) Cook on the second side until the chicken is cooked through or you can transfer to a 350 degree F. oven to finish cooking the chicken until it reaches 165 degrees F. Once cooked, you can remove the chicken from the skillet and make the sauce. 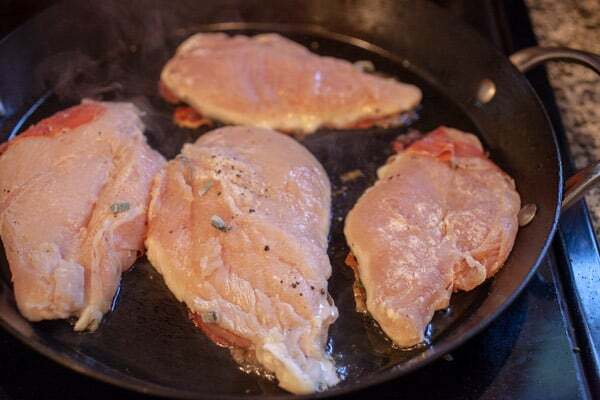 7) Turn heat down to medium for your skillet that you cooked the chicken in. Add white wine and lemon juice and use the liquid to scrape up any bits stuck to the pan. 8) Let the sauce simmer for a few minutes and then stir in butter, one tablespoon at a time. Add chopped parsley right at the end. 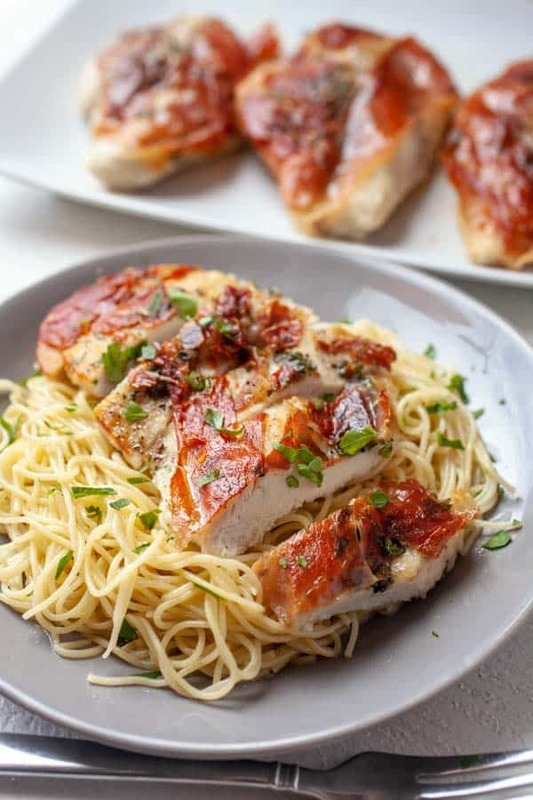 9) Serve chicken drizzled with sauce or toss sauce with spaghetti before serving. Recipe adapted from The Best of America's Test Kitchen 2009. This recipe isn’t hard, but there are a few things that can go wrong. You need to make sure your chicken is an even thickness and that you don’t over flour the chicken. You can buy pre-sliced cutlets but I usually just buy chicken breasts and then slice them horizontally myself. A good chicken cutlet should be 4-6 ounces by weight. More than that and it won’t cook evenly. If your cutlets are very uneven in width, you can pound them lightly with a mallet to even them out. Some difference in width is okay though. Very important: Dry off your cutlets with a paper towel. You don’t want a lot of extra moisture on them or you will get a thicker layer of flour. We aren’t making fried chicken tonight. We are going for a thin dusting of flour. Dredge your cutlets through the flour, hit them with some salt and pepper and then sprinkle that diced fresh sage on top. This will infuse that sage flavor with each bite. Next, get your prosciutto and lay one slice on top of each cutlet on the same side that you sprinkled the sage. Make sure to get sliced prosciutto and not shaved prosciutto. That will be too thin. Don’t use more than one slice. This stuff is plenty flavorful. If you have some over-hang, that’s okay. Just kind of fold it under. It might look like the prosciutto isn’t adhering to the chicken, but it will when it hits the hot pan. Now heat up the oil in your pan to medium-high heat. If you are trying to impress, get your whole sage leaves and toss them in the oil for literally 10 seconds. They will fry up quickly and get a bit crunchy. Remove them quickly though. Next, was the part I was really worried about, but I had faith in the cookbook. It said to cook the cutlets prosciutto side down first. This gave me some concern but I proceeded! I was no longer stressed about the recipe at this point. But I did need to get my ingredients ready for the very simple sauce. As soon as your chicken is done (4-5 minutes per side should do it), or you can transfer them to a 350 degree oven to cook through (you are looking for 165 degrees in the thickest part of the chicken). 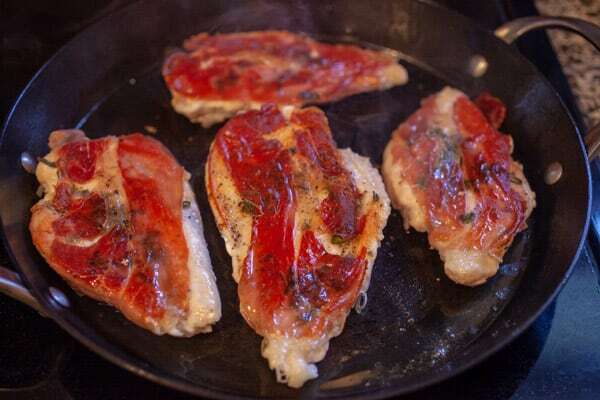 Remove your chicken saltimbocca from the pan and with your pan still on medium heat, pour in your white wine and lemon juice. Try to scrape up as much of the particles of food as possible. That stuff is all flavor. Let this simmer for about 4 minutes and then stir in your butter one tablespoon at a time. After simmering for a few more minutes you should have a very flavorful light sauce. Add your chopped parsley right at the end. 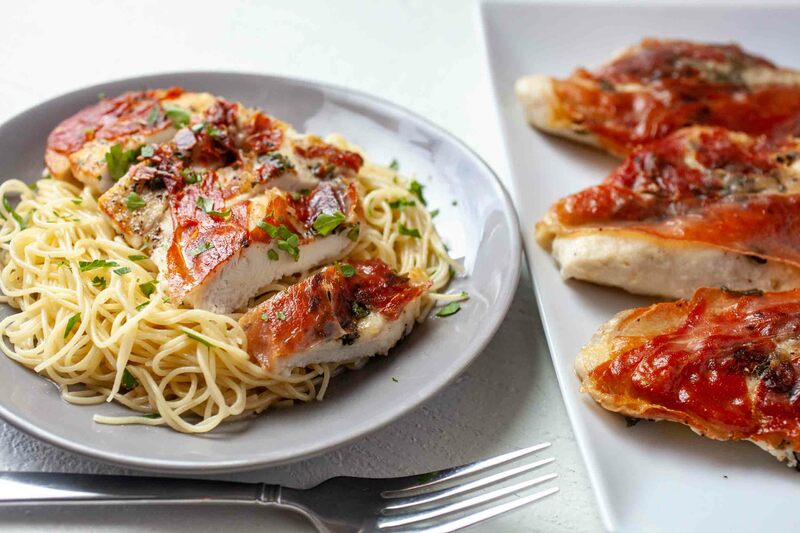 I tossed my sauce with some spaghetti and served that with the chicken saltimbocca and then topped it with some fresh parsley just for some WOW factor. This meal is one of those rare dishes that can really impress, but is actually pretty straightforward (and quick) to make if you have the right instructions. I think I was able to get it right on the first try and I bet you can too. Here are a few other great Italian Recipes! Looks delicious. 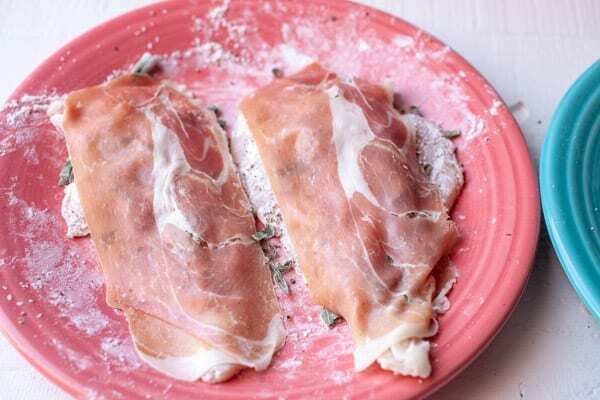 I've never cooked with prosciutto before and I think this is the perfect dish to try it on. Yum – a variation on the one with veal. I love the name of this dish, which as I remember translates roughly as "leap into the mouth." And by the way, Nick, do you also work at a "standard" 9 to 5 job? And sleep too? The white wine reduction is actually what's grabbing me here. Reminiscent of spring with the lemon and bright parsley flavors. I'm with Jean — love the name of this dish. Where do you buy your prosciutto? Do you have any brand(s) that you recommend? I am almost always disappointed with the taste when I buy it at the grocery store, even from the deli counter at Whole Foods. I don't always have time to make it down to the wonderful Italian Store (that is actually the name of the store), but I suppose that is the best place to go. I like the simplicity in which you narrate the process, especially the important bits like the thickness of the chicken cutlet, over flouring or too much prosciutto could mess the dish. A comment from @ryanstewart would have added "THE WOW FACTOR". You're fast becoming my 1st 'go-to' site for meal inspiration. This chicken recipe looks like such a winner, can't wait to make it. I've got to say, I was pretty impressed. Not only was I surprised that Nick could cook, but the chicken was awesome. My wife is a vegetarian and so I haven't had home cooked meat in a long time and this was a huge treat. He also got me excited about doing some cooking myself, so I owe him big time :). Thank again for dinner, Nick! Thanks for the comments and kind words everyone! @Sara I don't have a go to place for prosciutto unfortunately. For this recipe I used prosciutto di parma which is pretty good I think. I need to find a good deli though in DC. Tried, true, delicious!!!! Even better leftover in some pasta. I LOVE Chicken Saltimbocca. I just had it this weekend and it was a fabulous way to start my evening. For some reason, I thought there was garlic in it? Your prosciutto looks fabulous. That's a great recipe! I've got to try the white wine and lemon. I usually use a cup of Marsala wine (works GREAT with veal or tenderloin) and while reducing the stock, I add a few thin (almost shaved) slices of Vidalia onion. Rich, a little crushed fresh garlic is a good addition, but don't use too much. The Proschuito has a strong, salty flavor, and combined with the garlic it could overpower the chicken. Crush the garlic then roast it for 15 minutes. One clove will suffice. Linguini al-dente is a perfect base for any saltimbocca dish. Thanks again for the variation Nick! This will make a nice Easter Sunday special! I was wondering, since I do NOT like sage, what would you suggest to use on the chicken instead of it? To me, sage tastes like mould…ugh! !…at least in dressings. @Debra you could use any fresh herb honestly. Try rosemary? @Debra – I had the same thought when I made my own version of this recipe a while back. 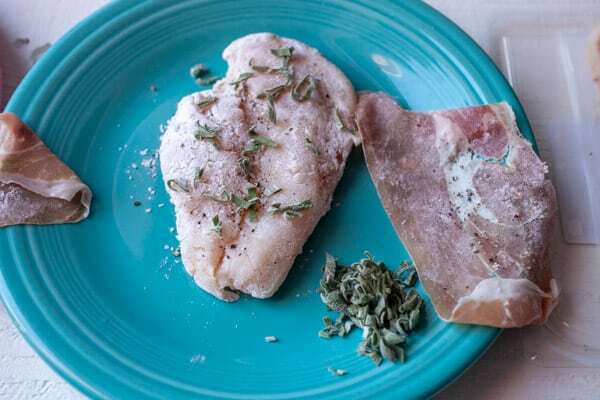 I use basil and it makes the saltimbocca smell and taste wonderful! thank you for posting this recipe! I watch Americas Test Kitchen and did this recipe as I watched the show ….. and its absolutely delicious and super easy! So I wanted to do it again and went to get the recipe online and I couldn't believe you have to join the webiste to get it! Ridiculous! So it was nice to get via you! thanks again! and you are so right! its a super impressive dish but dead simple! Made this with a friend tonight and we just loved it! So simple, so flavorful and gourmet tasting. I think anyone would love this. I had watched the America's test Kitchen episode this morning and just had to make it. Your pictures and steps looked exactly as mine did. I did make one addition. I used a little packet of trader joe's chicken base in the sauce and I used white vermouth instead of the white wine. I left out the parsley because I forgot it. I used prosciutto di parma from Trader Joe's. It was the only true Italian brand, the others were domestic and not nearly as flavorful. Great recipe, already sending to a friend! I made this tonight and it came out great! I normally don't like cooked prosciutto but in this recipe it's great! I did use dried sage instead of fresh (don't have a heart attack!) and it was still great! The fresh sage was just too expensive. Thanks for posting this and I love all the detailed pictures!